Resting on the hillside overlooking Hermosa Bay and her majestic sunsets sits a truly unique property. Casa Puesta del Sol is available as either a 3 or 5 bedroom vacation property. The upper Casa is 2700 sq ft. Sleeping 6 people with 3 bedrooms and 2.5 baths, the home is beautifully complimented with handmade tropical wooden doors,cabinets and windows. Custom made rattan furniture adds the finishing touches of luxury to this outstanding home. The pool with its sunken bar contains 4 full size bar stools, a sink and refrigerator also has 3 in the water bar stools and whirlpool with built in bench. The views of the ocean from all areas are simply spectacular. *ALL RATES ARE FOR THE MAIN HOUSE ONLY THE CASITA IS AN EXTRA $100 PER NIGHT. EXCEPT XMAS AND NEW YEARS WHERE THE CASITA IS INCLUDED IN THE RATE. *Pets MAY be acceptable with a much larger security deposit and increased cleaning fee. A private world has been thoughtfully created for your senses.The Rainforest Backyard abounds with fauna and flora. A rock waterfall with cascading waters into the lagoon pool and matching stone patio for sunbathing complete this magical natural paradise. Both homes are totally private yet so close together. Privacy is maintained even though both homes are located on the same lot because they exist on two different levels. When traveling with a larger group this feature allows for moments of retreatable enjoyment. 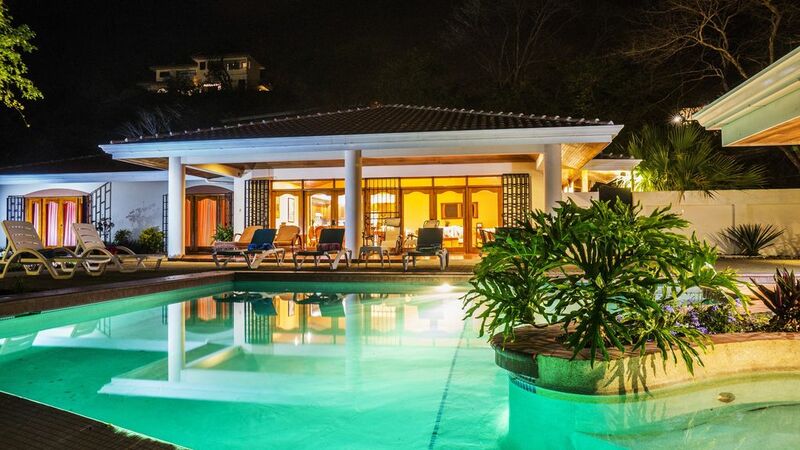 Nowhere in the Papagayo area will you find a property that compares with Casa and Casita Puesta del Sol. Amenities Abound: The upper home has full American Kitchen with all the utensils needed to prepare any meal. All bedrooms have TVs and DVD Players. Dining seating for 6 and additional space for 3 at the kitchen's raised granite countertop. Outside a 35 by 12 ft covered patio with fans is the perfect place to relax from the sun or have that evening cocktail as the kaleidoscope of colors explode in front of your eyes in sunsets that are just too incredible to believe. But you do need to see this wonderful country and the Home has the perfect location from which to journey. Hermosa is the closest beach community to 2 National parks and to the Arenal Volcano. Playas del Coco is 10 mins away, nightlife, dining and full market. Casa Puesta has amazing views of the ocean and sunsets. It also has the one of the largest backyard areas in Hermosa allowing for the entire group to mingle poolside. There a several shaded areas. With a combo rental you can have 2 areas to relax and get some privacy from the others in your group. Bathroom #1 is private to Bedroom #1. Bathroom #2 has a private entrance to Bedroom #3 and public hallway access. The Casita has a unique step down sunken tub/shower on the 1st floor bedroom level and a shower stall on the upper floor living room level. Both local and a Magicjack phone allowing for FREE CALLS to the U.S. and Canada. People calling you will be calling a New Jersey phone and will incur normal charges, if any, for a normal call there. There is seating for 6 at the table in the Casa and 3 more bar stools at the counter. The Casita has a table for 4. RATES DO NOT INCLUDE CASITA RENTAL WHICH IS $100 PER NIGHT EXCEPT THE HOLIDAY RATES WHICH INCLUDE THE CASITA IN THE RATE> Telephone with U.S. Telephone number Free calls to U.S. and Canada. Friends and family call you by calling a U.S. telephone. maid service is available for fee. Wireless high speed internet access. Beautiful Home with Incredible Views , hated to leave. The only negative of the whole week is we had to leave . We enjoyed unbelievable sunsets and breath taking views of the Pacific ocean. Plenty of indoor and out door space for our large group for lounging in the sun or shade and for eating our meals. We cooked most meals in the well equipped kitchen and dined out on a couple of occasions and with a large diverse group like ours I can for sure recommend Captain Morgans restaurant and CocoNutz Bar and Grill . Jeff the owner made our family vacation very enjoyable and stress free, even contacted us on our first full day at the house to make sure everything was to our satisfaction. Also want to send a big thank you to Grethel Jeff,s house manager who was very cheerful, helpful and always just a phone call away. This is a trip that goes down as the best family vacation so again thank you Jeff and team at Zindis and we hope to be back again some day. You know I am a very lucky person I always seem to get the best renters. You were a joy to have and to think were are even consider to be the "best family vacation" just makes all the work worthwhile. I forward this review to Zindis as they play a huge part in making the experience what it is. Superb place to stay with family! I cannot say enough about our stay! We rented the casa and the casita for my family of ten, which included 4 children. Both houses were impeccably clean and well stocked with dishes, linens, towels, etc. Both pools were great along with wonderful patios. Grethel, the house manager, was only a phone call or text away and is worth her weight in gold! The houses have great security systems, which is a safety must. Door alarms are on so one knows if a little one has ventured out near either of the pools too. We would lay by the pool or utilize a local tour company for excursions. On several occasions, we lit up the great charcoal grill and cooked tasty local meats and veggies. I would highly recommend either house to couples or family. The owner is very involved and helped us to find our way to a wonderful place called Cortez Falls, where the grand children jumped off rocks into the water. What a video! Just a perfect place to stay!!! So glad that you had a great vacation. We ,everyone involved with Puesta del Sol, work really hard to make your vacation a great memory. This review is our reward and thank you so much for choosing Puesta. Please come back you all were great renters. We had an outstanding visit to CR in January 2019 and were very pleased with the home. The concierge team at Zindis were knowledgeable, professional and very accessible. Great location with reasonable walk to the beach, restaurants and a priceless sunset view . We had the Casa and Casita which worked out great for our extended family. Definitely will return! This house offers among the best hangout areas you can ask for. The back of the house is pointed at Bahia Hermosa and that backdrop is something you can stare at all day (especially with a few frosty drinks from the Ninja blender!). Our family likes to play in the pool - this pool was wonderful. It goes from a zero depth, ramped entrance (older folks and wheelchair users would love it) to a full 6 foot depth. In addition, it has a swim-up bar in which your non-swimmer family members can be bartender and deliver you drinks. Jeff provides plenty of good plastic cups to take out on the deck. Oh yeah, and there is a bathroom in the poolhouse so you don't have to go inside and get the floors wet to visit the restroom. The kitchen is fully stocked for cooking meals and also gives the chef a clear shot at the killer view out back. We made our own meals but also had a local chef come in and cook some traditional Costa Rican food for us - what a treat (and they clean up)! Bedrooms are fine and we also rented the Casita next door for two more bedrooms. In addition to the two en-suite bathrooms there is a hallway powder room for guests to use while visiting the house. Jeff the owner was very helpful to us in learning about support services (the chef; on-site massages, etc.). He called upon our arrival to make sure we understood how to use everything and locate all the lighting switches for the nice outdoor lighting. Each night we watched the sunset and then hung around on the back patio and talked all night. The Bose boombox can be brought in and out for plugging in your music day and night. I also want to give a shout-out to the restaurant Ginger - one block away from the entrance gate. Top-notch tapas in a faux Treehouse setting with fantastic service! We ate there two nights. Bottom line - this is a great house and location for Costa Rican sunshine and a basecamp for other activities in the northern part of the country. Joe it was a pleasure having you and family stay for the holidays. I am so glad that you all had a wonderful vacation and enjoyed the house and all its features. Please return, as having guest such as yourselves is always an owners pleasure. Beautiful place with stunning view ! Beautiful location with a stunning view and breath taking sunsets. The property manager , Grethal, was extremely helpful, kind and available. We planned three family tours with Tico Tours and were impressed with their staff and the quality of tours. Christmas in Costa Rica will always be a wonderful memory. Located only 20 minutes from Liberia International Airport, this new property is well situated for those seeking adventure while appreciating the pleasure and convenience of Luxury Accommodations. Minutes off our beach is arguably the best deep-sea fishing in the world, Witch's Rock's renowned waves are 25 min. Cultural shopping in neighboring Del Coco (10 min.) and Liberia (30 min.) Brilliant Hiking, Hot Springs, Mud Holes, Waterfalls, Remote Beaches and more all within an hour at Santa Rosa and Rincon De La Vieja National Parks. Tropical scenery and gorgeous views lie about all over Costa Rica, a memorable drive east takes you to Monteverde's Cloud Forests and Arenal's surreal feel in 2.5 hrs.